The following links are those I have found to lifeboat related websites which I feel you may be interested in. Please note: I am not responsible for the content of external websites, if you come across a dead link please let me know, likewise if you would like to suggest a website for inclusion here check the information at the bottom of the page. 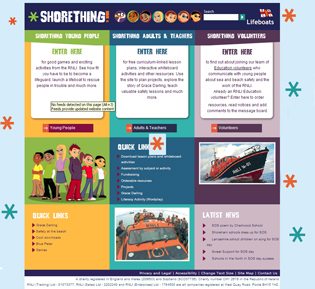 If you are have a website related to lifeboats then you are welcome to request a website link here. Simply contact me with your URL and some background information about your website. I try to verify the links on on a regular basis, however with so many links it is not always so easy. I would ask that once your website is accepted that if you change your website address or if it become unavailable that you let me know so I can change it. Links which fail verification will be marked as such and removed shortly thereafter. 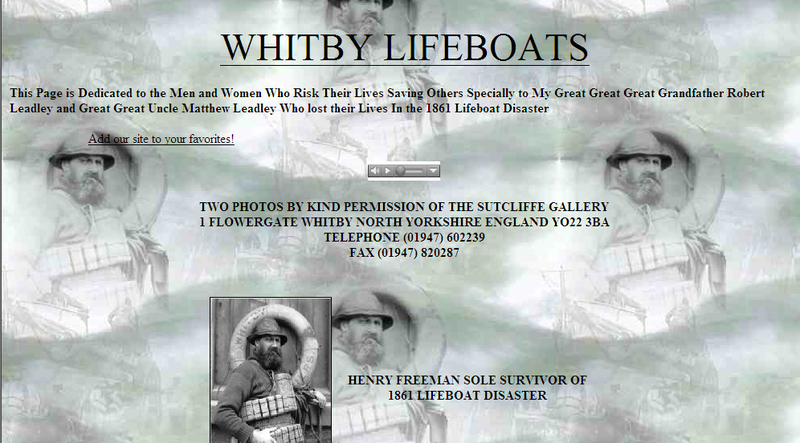 Whitby Lifeboat Station is our local station and therfore the first to feature on this page. The station represents one of the busiests stations on the east coast, however as good as the design and layout is it sadly let down because it rarely updated. Whitby Lifeboats is more than an enthusiasts website, this belongs to a Great Great Great Grandson of Robert Leadley and Great Great nephew of Matthew Leadley who lost their lives in the 1861 Lifeboat Disaster. The website is really informative and as a personal website it is well worth a visit, simply follow the link to the right. Scarborough Lifeboat Station, is the next all weather lifeboat south of Whitby. The site has been awarded the Maritime Webs Gold Award in the past and is therefore a interesting website. Staithes and Runswick RNLI Lifeboat Website may be basic but it is still an informative website, unlike many lifeboat websites it is updated in an almost real time mode, quite an achievement. Runswick Bay Rescue Boat is a website that provides background information about the Runswick Bay Rescue Boat after the RNLI closed its offical station in 1982. Serving on a voluntary basis, the Rescue Boat has operating costs of around £5000 per year, much of which is met by the local community. Independent Lifeboats Uk, The Independent Lifeboats UK website was set up to increase both public awareness and funding of Independent Lifeboat services throughout the UK and the world. None of the Independent Lifeboat Services featured in the site are managed or funded by the RNLI or the government. They are run and rely on donations from the general public, businesses and their own fundraising events. The Seahouses Lifeboat Station is one of my favourite lifeboat websites, hence its feature here. The station covers much of the Northumberland coastline an area I enjoyed diving. The Royal National Lifeboat Institution needs little introduction, a charity not funded by the government yet big ehough to serve the British Isles. Shorething A fun and exciting website for the younger enthusiast with exciting downloads. It has wall papers, screensavers and things to entertain and share. Lifeboats 24 - 7 is a five star international and very comprehensive website, a must for lifeboat enthusiasts. It covers quite a lot european lifeboat stations with links to many of today's lifeboat stations. The Flamborough Lifeboats An interesting look at lifeboats serving the Flamborough area. 44ft Motor Lifeboat A website that contains an amazing amount of U.S. lifeboat information and is dedicated to the remarkable 44' Motor Lifeboats. I have added it here not only because it is lifeboat orientated but because it introduces the USCG 44328 lifeboats the RNLI acquired in 1964. Twenty one boats were commissioned and classed as the "Waveney" type of lifeboat after the river in which the first boats were built, I hope you find the as interesting as I have. Shipping Forecast Latest Shipping forecast from the Met. Office. Inshore Forecast Latest inshore waters forecast from the Met. Office. The hyperlinks below lead to website's which are related to lifeboats and those supportive of the treasured work carried out year in year out by the RNLI. When designing this part of the website it was my hope to be able share relevant lifeboat orientated links. Compiling such a comprehensive list of suitable websites has taken sometime. The hyperlinks are intended to help promote the work done by other lifeboat enthusiasts and current RNLI crews and volunteers. I hope that you find the websites interesting, just don't forget to come back! If you come across a broken link, I would be most grateful if you would let me know so that I can fix it as website addresses invariably change on frequent basis! If there is a website that you feel deserves to listed here please contact me.